In the previous article I have explained Populate Dropdown List dynamically using Asp.net MVC Razor, Code First migration in asp.net MVC 4, Create, Read, Update and Delete in Asp.net with MVC 4 Razor view Engine using Entity framework with Code first approach and What is Asp.net MVC? Its advantages and disadvantges. I want to populate State dropdown on Country selection and on State Dropdown Selection populate City dropdown. I have three classes in model Country, State and City. 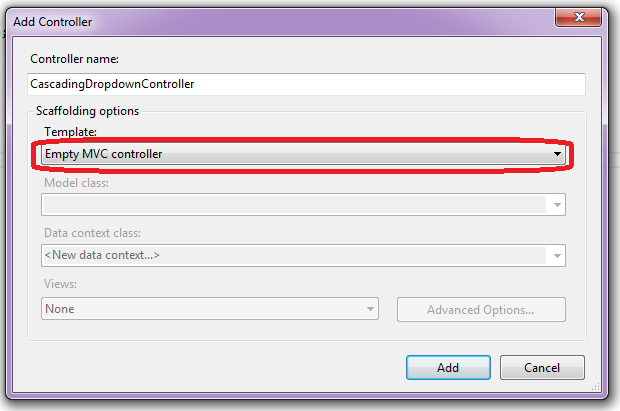 After that I add a new Empty MVC Controller to project. Now add a Empty view for Controller. Based on selection of country drop down control, which method shall i call first to populate state drop down? There is no ViewData item of type 'IEnumerable' that has the key 'Country'. What is the error? You can download the project. Now in userdata your desired data would be available. Specifies which method in which controller the execution will transfer to. @Scripts.Render("~bundles/jquery"). how to solve this error?? Glad you hear it helps you.